The Option Coach is the business of teaching option trading strategies and trading techniques using internet virtual classroom and group presentations to people who want to learn what it takes to be profitable. 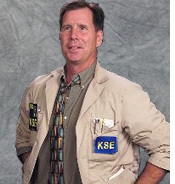 I've been involved in the option trading business since 1984 when I graduated from Iowa State University and took a job as a runner at the Chicago Board Options Exchange. My goal was always to become a market maker and trade my own money as an individual member on the floor of the exchange. I moved up from a runner to a phone clerk to a trade checker, took classes, and read books on how to trade. I always felt that traders and market makers had insights only learned by experience of managing risk. I took a job executing stock for market makers in the trading pit while they were trading options. I could see the mannerisms of brokers and traders as they both struggled to make money. I learned how to call and speak to brokers on the floor at the NYSE and the AMEX and how they prioritized their orders. The day of the Crash in 1987 I was executing stock in the GE pit where options on GE, PEP, HUM, and BDK traded. One of market makers I did business for grabbed my tie at 8:00 am and gave me a scale order to buy at total of 50,000 GE 10,000 shares at a time. The trader executed stock through me every day so I had no reason to question his motive. When GE opened at 10:30 am CST that morning I called the NYSE for a fill report and was told the orders were cancelled. Never saw that trader again but that October day clinched it I knew I could trade and make money. I took a job with a couple of market makers and every day I readied their position cards for them, dissected their trading positions and learned how they managed option inventory as a means of managing risk. Trades use their "Greeks" which is a derived number that aggregates risk and simplifies option positions. The biggest difference between customers and traders is the way traders manage their trading positions. Customers have trading plans and traders use the Greeks to determine when to adjust trading positions. We will examine how both methods can be used trading and managing risk. Traders understand every position they have on like someone doing a crossword puzzle understands how the puzzle comes together. Learning to trade means remembering where the underlying was when a trade was entered, and the risk behind the numbers. Being a profitable trader also means knowing the volatility of the options, and planning your exit strategy before you execute that first trade.